Here's your source for a clear approach to discovering the next big stock market turning point! The answers you get depend a lot on who you happen to be listening to that day. The pundits, professional forecasters, fund managers, and even other traders all disagree-- each one has a unique opinion about when the top will come, and how big the crash will be. It can leave you pretty frustrated-- unless you're ready to figure out the answer for yourself! 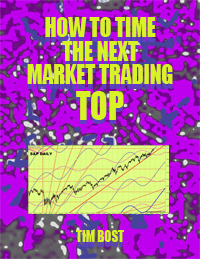 Now, thanks to this new e-book from market astrologer Tim Bost, you can have all the tools you need to come up with your own forecast of time and price for the next big market turn. It's an incredible resource that belongs on every trader's desk! Best of all, this important new publication is available as an e-book, so you can get it right away as an instant download. Think and act independently of the talking heads and trading gurus! Time your own trades for maximum profits! Be more confident in taking your own market positions! Use esoteric knowledge that other traders don't have! Add to the fun and excitement of your whole trading experience! But above all, don't delay. This valuable new trader's resource is ready for you to download right away – just click the orange ORDER button and you can get started right away! Scroll up and click the orange ORDER button right away - your report will come to you as an instant PDF download.